This may actually be the first game PeteB and I have had this year, actually since before Blog Wars 8 last year! 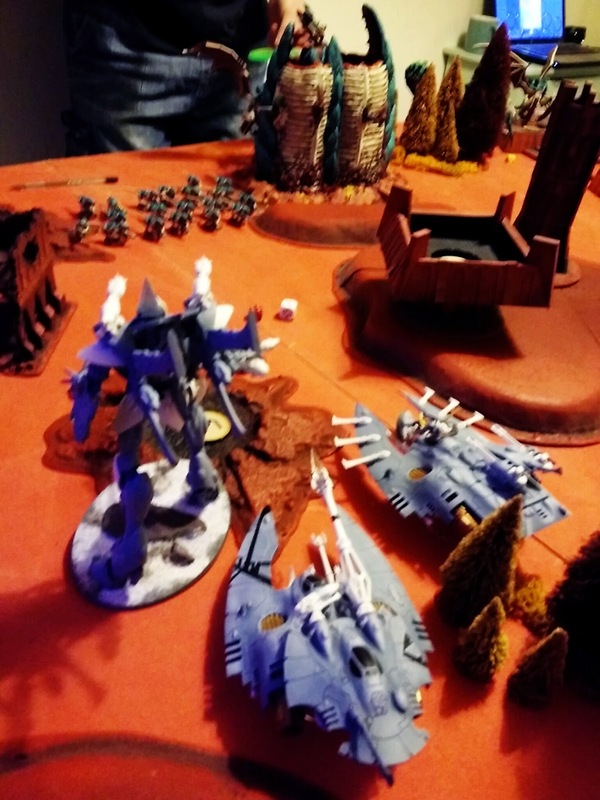 Having sold his Space Wolves and started back up on Eldar only to have his raison d'être - Wraithknight/Wave Serpent spam turned upside down by the new Craftworld Codex it was overdue we had a bash. This face off has been postponed a couple of times due to my illness, and Pete's new job but finally lets see what we've got. Warlord Trait - Move through Cover and Stealth in Ruins! Night fighting first turn, lost deployment, went second and failed to steal the initiative, yeah, that's right ones all round, where were you when I needed a darn Catalyst?! 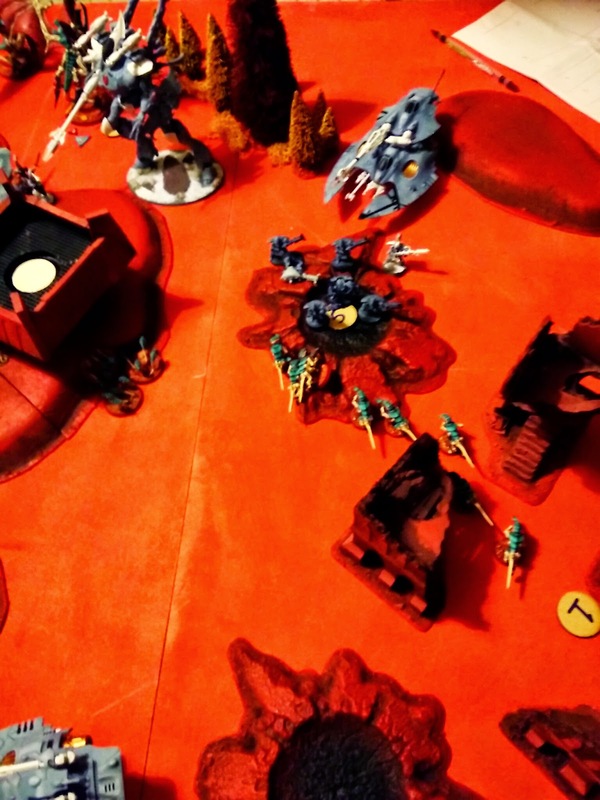 I deployed with most of my high value items on the opposite flank to Pete's Wraithknight, Prism and Serpents I put the gaunts over on that flank to Objective Secure the objectives when contesting against his units. I foolishly positioned the Flyrant for synapse that didn't take into account his units could move to get a bead on him round the corner of the Bastion for shooting! But we'd already chatted too long and we were down to 2 hours for the game! 1VP to destroy a vehicle or MC. 2 VP if 3 or more destroyed. 1VP to destroy a unit in shooting phase. 2 VP if 3 or more destroyed. Pete was easily going to score mission 3 as he already had 2 objectives and only had to move to score the third. Having got the angle on the Flyrant he took a wound, with only cover and night-fighting stopping it from being worse. Amusingly the Fire Prism immobilised itself which brought back memories of his old Rhino getting stuck on the weediest hedge you've ever seen. So Pete took the one VP for his mission as consolation and it was my go. 2VP to secure objective 5. 1VP if a unit has Linebreaker, 2 VP if 3 or more units do. 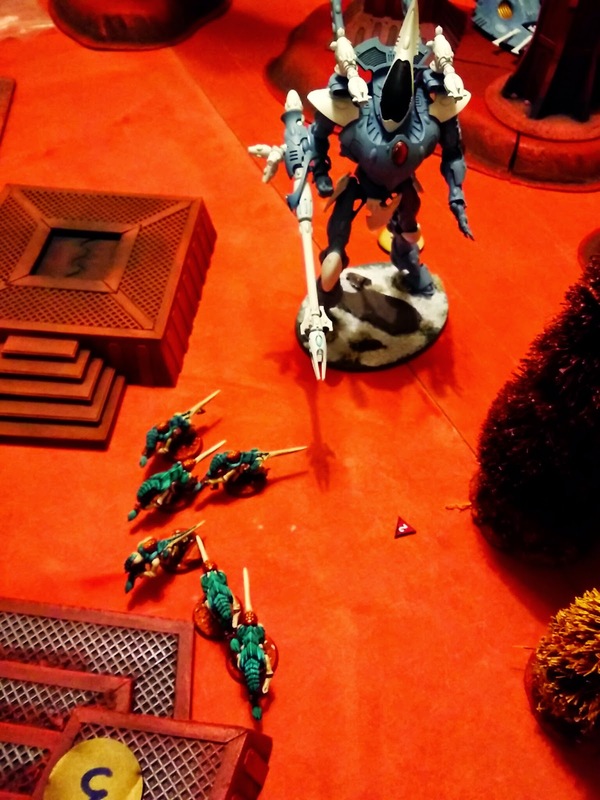 Mission 1 was out, the Eldar had got Obj5 and I wouldn't be able to get the gaunts there to contest. I could get mission 2, thanks to reading up on the rules of FMC's and discovering they can actually still 'run' when they swoop. So I managed to get Onslaught off on my left Flyrant, 'ran' into his deployment Zone and also got to shoot at the Scorpions for little effect. Meanwhile the Warlord Flyrant targeted the Warp Spiders who disappeared out of sight behind the little watchtower as soon as he cast his baleful gaze in their direction! 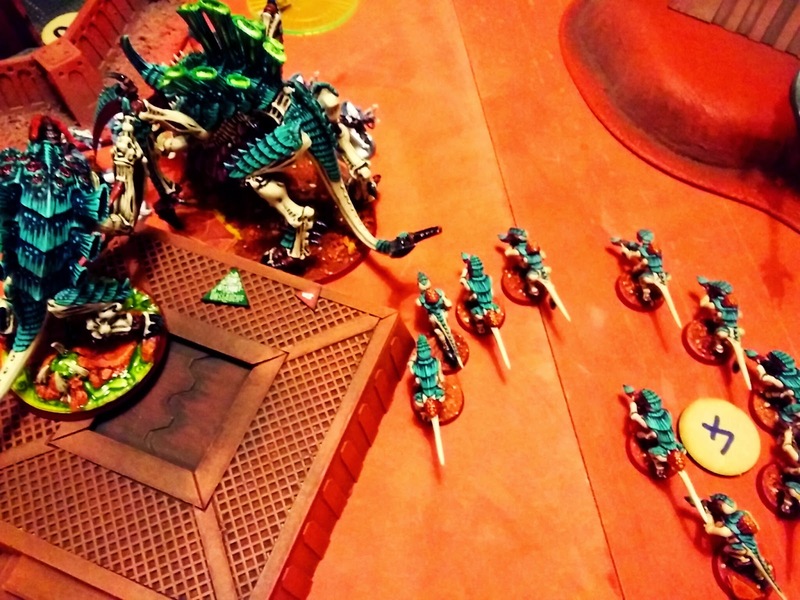 The Tervigon and Carnifex also surged forward with the Tervigon spawning 12 without doubles. Pete's 2nd turn and he rolled to secure objective 5, which he could do with ease. I'm not quite sure what happened in his turn, mainly killing gaunts like it was a fashion trend and my Malanthrope helping to keep everything else alive. 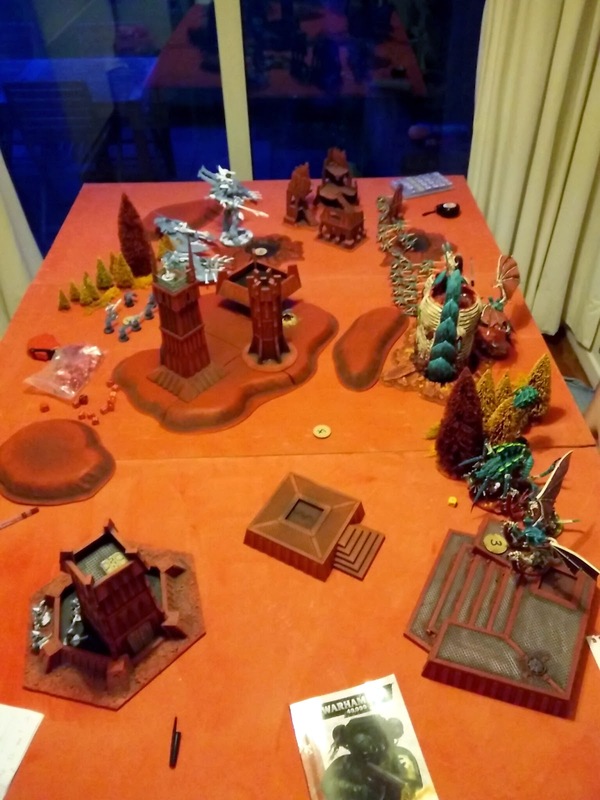 He also flew his Fire Dragon Wave Serpent across half the board to get close to my Bastion. 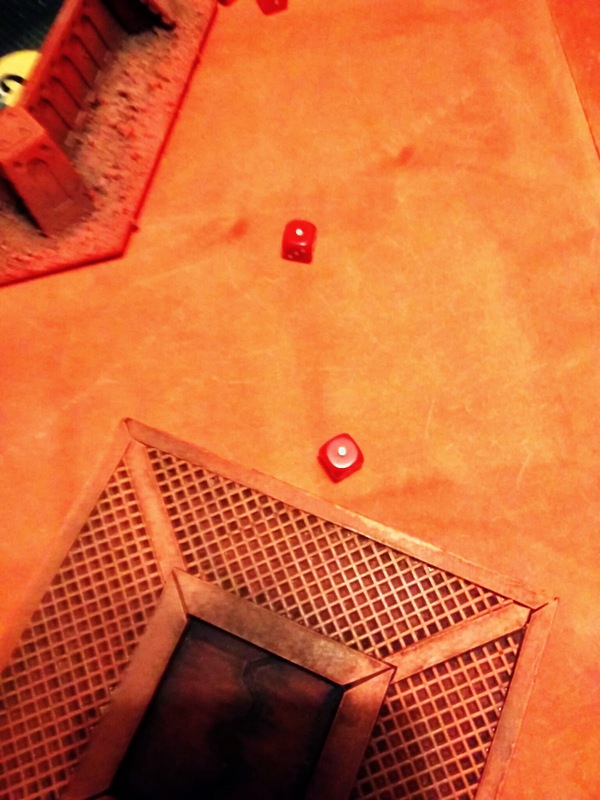 The pic below is actually Pete's turn two, but in my turn two only my Rippers arrived from reserve [lazy Stealers! ], deep struck and deviated away from objective 5. Luckily the Termagants managed to steal objective 5 from the Warp Spiders and the Rippers would eventually run into scoring range too. The Flyrant shot the back of the Wave Serpent, which was wrecked allowing my Warlord Flyrant to shoot the disembarked Dire Avengers with some success. 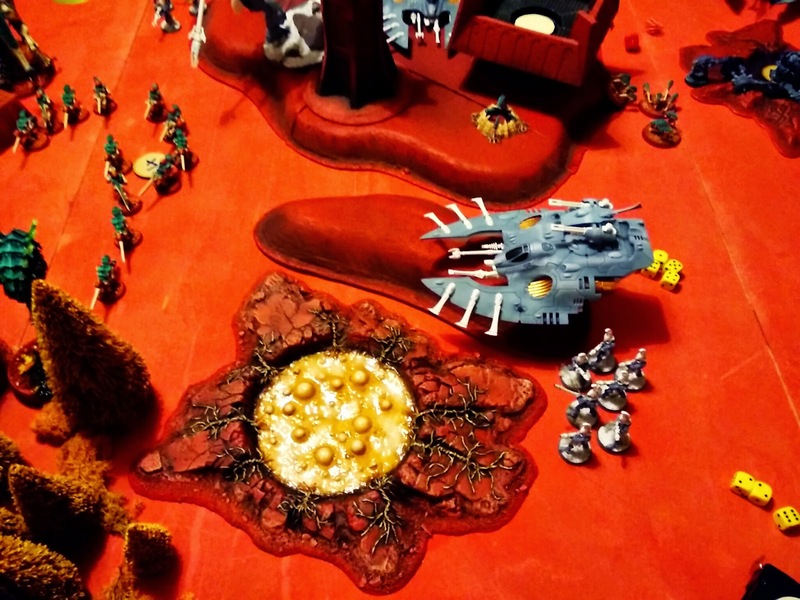 I contested objective 5 but shot at the Warp Spiders who jumped out of the way leaving me alone in the crater. 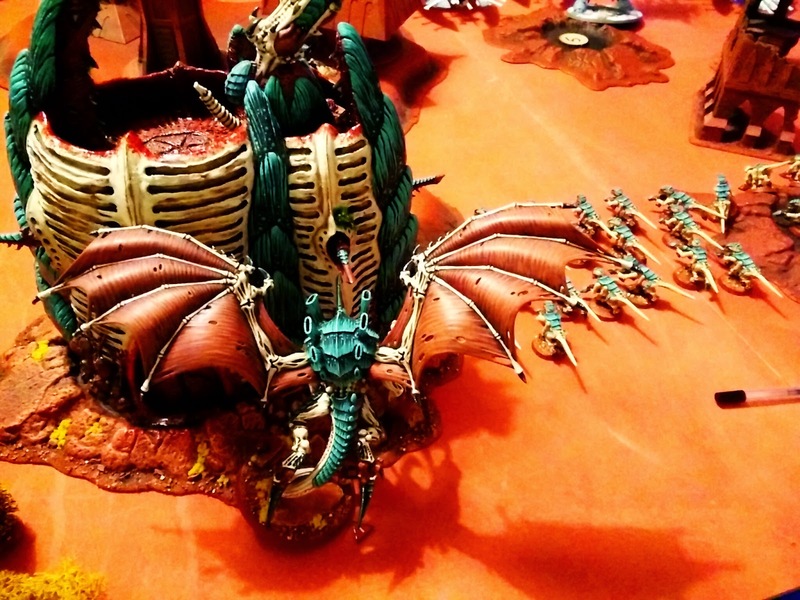 Pete got the Fire Dragons out and promptly turned my Bastion to sludge. Warp Spiders managed to do some serious damage to my Termagants who end up outside of synapse range requiring a morale check. I passed on 6 and would subsequently pass all morale and Instinctive Behaviour checks on this unit on a 6 in various forms for the entire game! 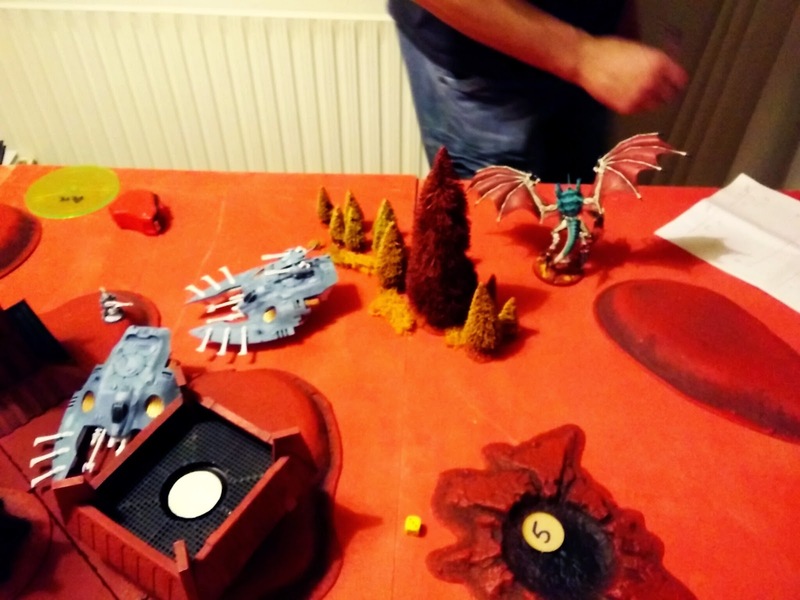 At around this point I lost 'The Game' but this is the 'Tervigon Game', wherein I realised I had forgotten to spawn any Termagants in my 2nd turn which usually heralds the Tervigon's impending demise. You may recall the exact same thing happened in my last game with Otty. She'd already taken a couple of wounds from various other quarters, including the last Dire Avenger. And then the Striking Scorpions happened, sallying forth from the building they occupied. She killed a few in overwatch but was chopped into bits, although I think only just losing those last two wounds - so close. I'm also pretty sure I'd hoped to charge the building with my Carnifex in my previous turn but failed the distance. It's almost as if the dice were against me! 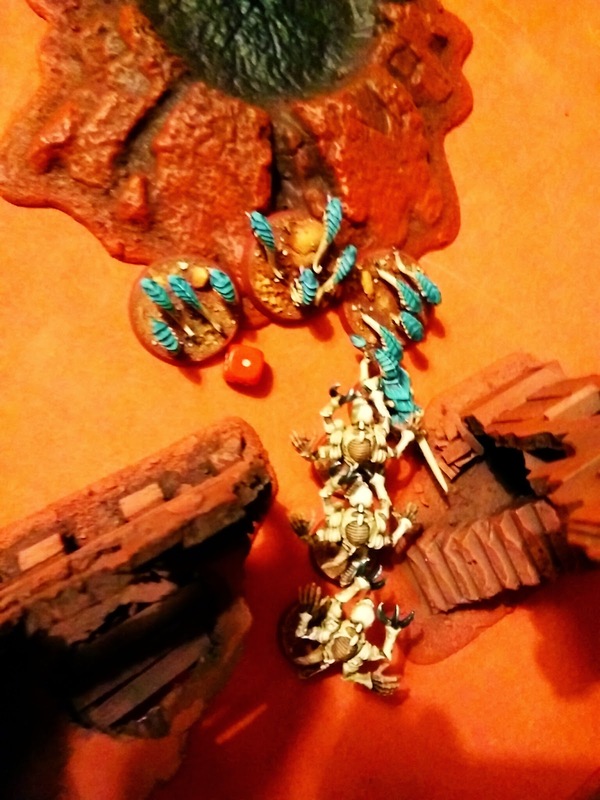 Gaunts burst apart at her passing but the Malanthrope kept them in check. The Scorpions consolidated back behind the defensive walls. In my turn I would need to secure Obj 4 off to my left. 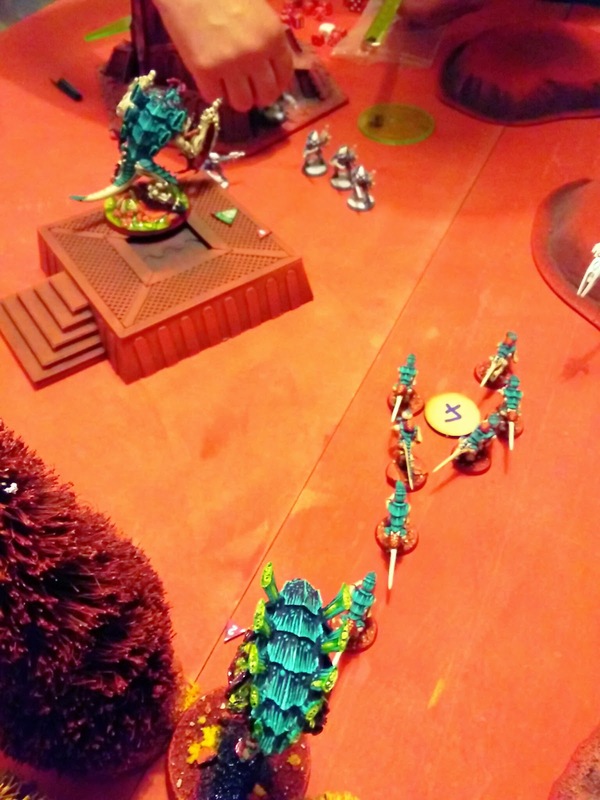 The gaunts managed to just get into range with the Malanthrope taking cover to the left of the large Ferron Fire Fir. A brood of Stealers woke up in the ruins on the far right. 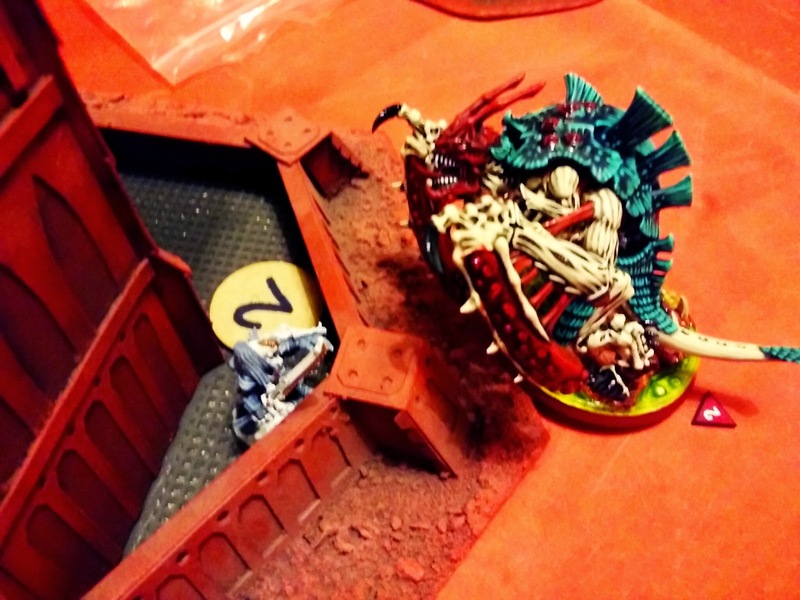 The Carnifex chased the Scorpions down. I killed 4 in shooting, leaving just 2 behind the walls. I charged and ended up suffering 2 wounds in overwatch thanks to their stupid little Shurikens. 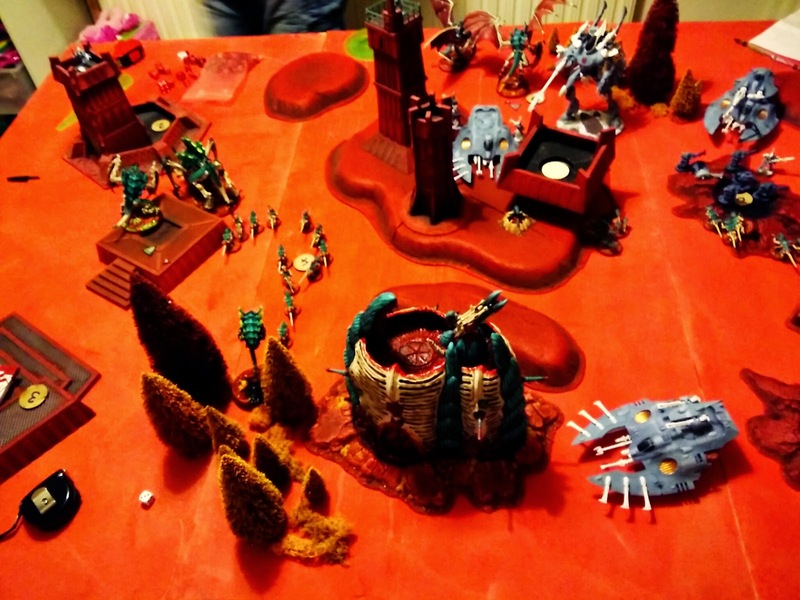 I only got 1 Hammer of Wrath off, squashing 50% of the remaining Eldar. 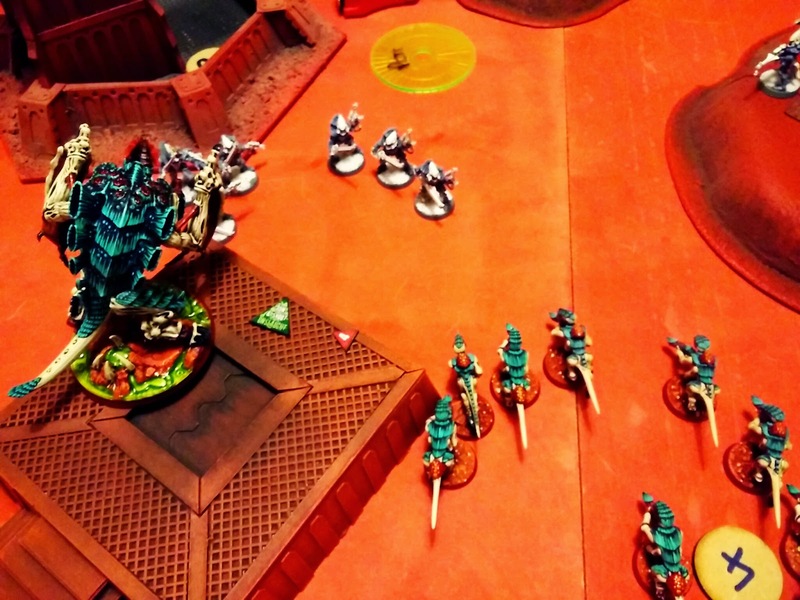 Only for the Exarch to slice and dice me like sushi with just 2 AP2 wounds removing the Carnifex from play! The Fire Dragons [who were out of shot on the right of the Fir trees] shot at the Malanthrope. It had taken two wounds already but it's cover save was strong. However the Wraithknight jumped round the trees to get an unobscured view and blew it to pieces. It also took out some gaunts, possibly all of them. This was the last turn as time had run out. I was 3 VPs behind. 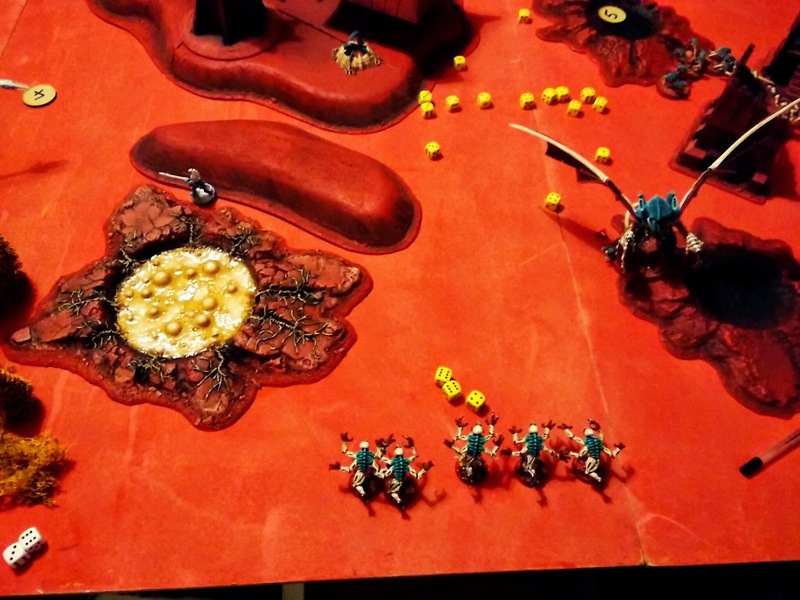 Both my Flyrants were surrounding objective 5 and I had missions to have 3 units in my own Deployment Zone, 2 VPs to kill 3 or more units and 1VP to kill his Warlord [which would also net me another VP for Slay the Warlord]. I got only one brood of Stealers come in from Reserve so I brought them onto my table edge now I needed two more units. I'd surrounded the Warp Spiders, killing most of them but the Autarch was in combat with the Termagants, with only the Rippers and 3 remaining Stealers from the ruins. I had the two flyrants to gain my DZ but would give up on the VPs for destroying 3 units and line breaker. So I took a gamble. Warlord Flyrant flew for Line breaker. Stealers and Rippers bundled into the Warp Spiders. 2nd Flyrant went for the Fire Dragons - the only thing in range of my DZ and swooping turn. I was doubtful only one Flyrant could kill the Fire Dragons and I was proved right with the Exarch surviving on his own. My Warlord Tyrant secured linebreaker and Destroyed the Fire Prism, thanks to its inability to jink. That lone Dire Avenger mocking me in the distance. 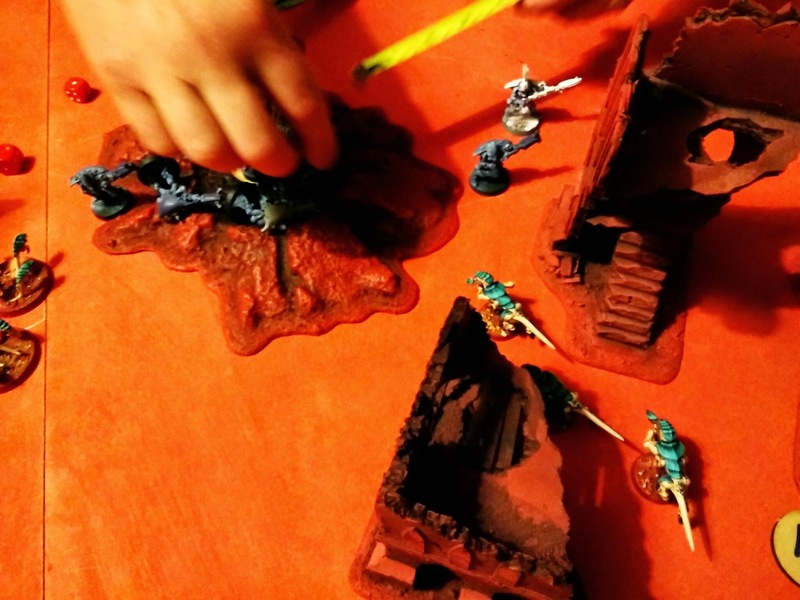 The melee on objective 5 came to a messy end for the Autarch, with the rending claws of the Stealers cutting him to pieces. This secured me 2 VPs and two thirds of my objective to kill 3 units, but not quite enough. 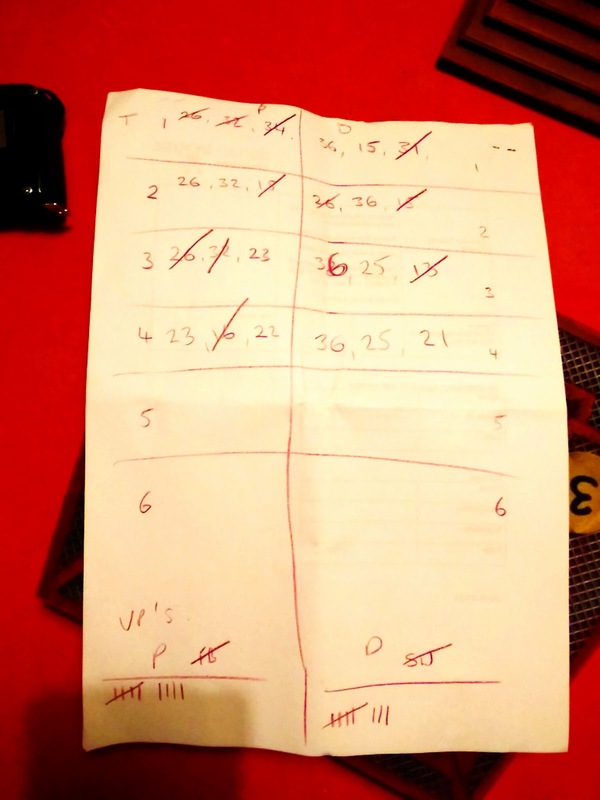 Here's the score sheet, it's not quite correct as we think we included First Blood on Pete's side, although we couldn't remember what First Blood is. However, we realised there isn't any First Blood in BW9, it's First Strike - kill a unit in your first turn, which neither of us achieved. So the final score was 8 all and it was a really great game. Before the last turn I didn't even know what the score was, I wasn't even playing to win, just going from one mission to the next. It actually felt like I wasn't playing against Pete, just playing against these random set of conditions that were created each turn. It's actually a nice way to play. 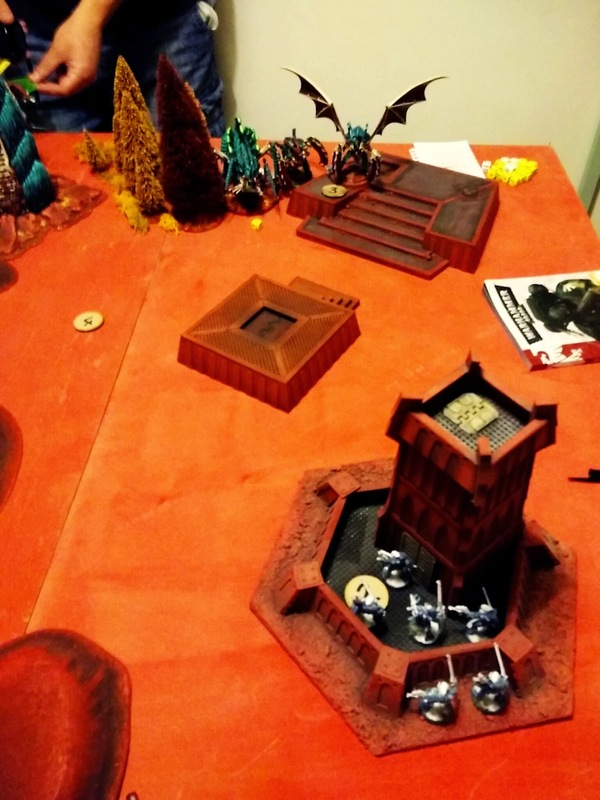 We both had our fair share of misfortune - the Fire Prism being immobilised, the Carnifex getting shot before it could do anything and my useless Broodlord who never showed up. 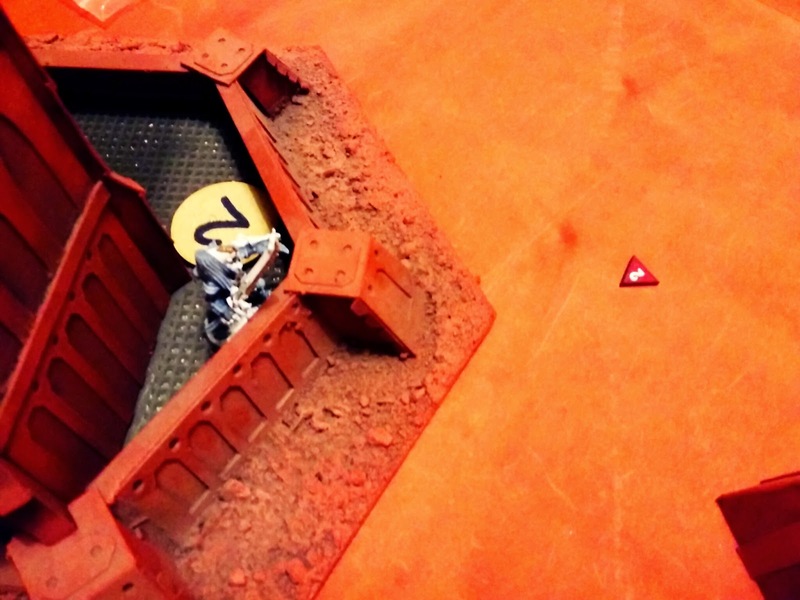 I realised afterwards I should have put him in the Bastion on turn one and have him come out of the Escape Hatch. At least he'd have been able to do something. I've gone a bit down on reserve rolls, without access to a Comms Relay [so I could take the only slightly useful Quad Gun - it actually shot really well considering it was on auto-fire] there's no way to raise those odds. But it was a great game with plenty to think abotu going forwards. 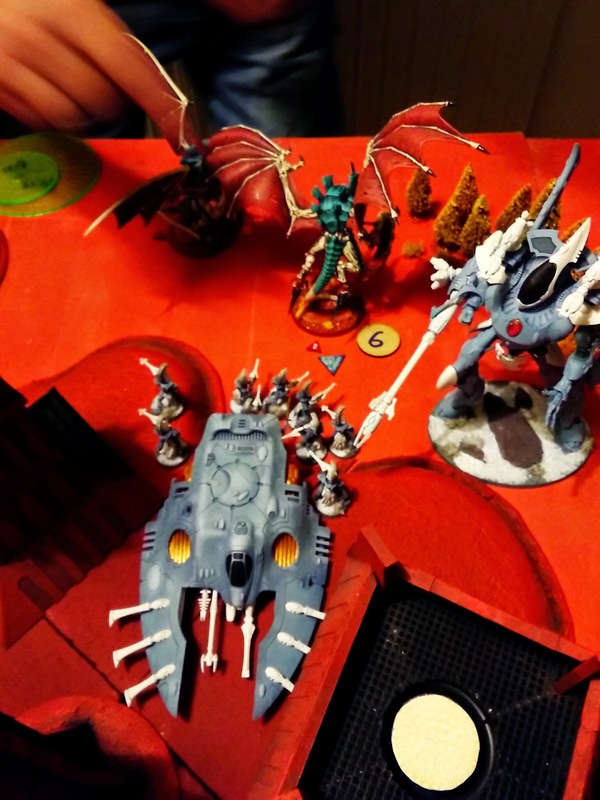 Nice report Dave, Pete was using the new Eldar dex so what did you guys think of it ? I think he's disappointed about investing in a list that's no longer viable but excited about the range of possibilities going forward. Great game. Love it when they are so freaking close! Nice pics as well!